[Andrew] is bringing his old mechanical sewing machine into the 21st century by adding an Arduino control module. Originally, his Alfa sewing machine could only do a straight stitch or a zig-zag of varying widths. Since this was an old sewing machine, all of the controls were knobs and levers. RC car servos were installed in the sewing machine and now are solely responsible for controlling, in real time, the horizontal movement of the needle and the amount of stroke of the feed dogs (the metal components responsible for advancing the fabric through the sewing machine). There is also a switch on the needle bar that feeds back to the Arduino when the needle is in the full-up position. 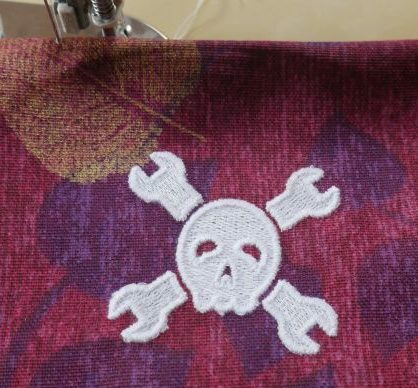 With full control of the stitch width and fabric advance, it is possible to come up with some awesome stitch patterns that were not possible on this machine before. Each of the stitch patterns are pre-programmed in the Arduino. Right now it is possible to control the sewing machine over the Arduino’s serial USB connection but the workflow for such an operation is in its infancy. [Andrew] plans on making this sewing machine fully automatic so that he can embroider letters and numbers. Although the project is still a work in progress, [Andrew] has made his preliminary Arduino code available for folks who want to further his accomplishments. To continue reading about hacked sewing machines, check out this one converted to an embroidering machine. If you were in the market for a sewing machine with embroidery capabilities, you’d either be spending a bunch of money or settling for a lower-cost machine that can only do a handful of pre-programmed designs. A DIYer by the name of [SausagePaws] came up with a 3rd option, he would build one himself. He was also highly motivated, [Mrs SausagePaws] wanted one! An off the shelf embroidery machine is similar to a standard sewing machine except the movement of the fabric is done automatically rather than by hand. Not only does the work move, but it has to move in time with the needle traveling up and down. [SausagePaws] took a no-nonsense approach and decided the simplest way to go about the task was to mount an embroidery hoop to the end of an XY drive system.